Why Buy From AT3 Tactical? THE BOOK EVERY AR15 OWNER NEEDS TO HAVE – GET IT FREE! 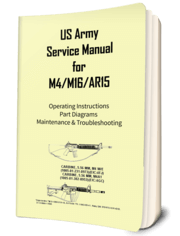 It’s like the Missing Manual for AR Rifles! The buffer weight may look like a paperweight, but without one your rifle is effectively an awkward, single-shot rifle. We’ll take a look at the main types of weights, what they’re used for, how to use them to optimize your rifle's gas system.